Route description: As you look up and across the road, you will notice the creek that runs steeply down from the basin between Melderskin (left) and Laurdalstind (right). 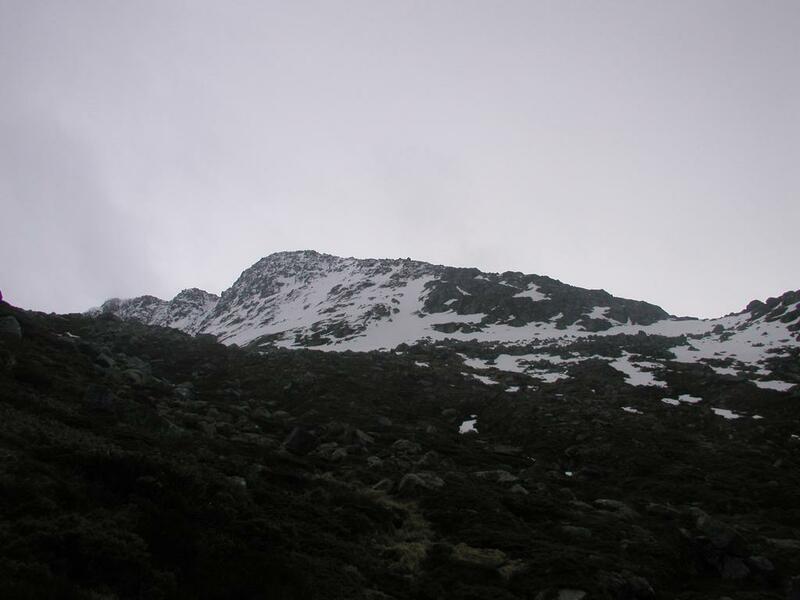 The overall strategy is to climb up to the basin, staying on the right side of the creek, then enter the ridge (on the right side) and follow this to the summit. More details follow: There is actually a fairly well marked trail that goes all the way to the basin. A more precise description may be a route rather than a trail as very little use leaves few signs of a trail. In order to find the trail, proceed through a gate by going a short distance back on the road, then turn right and go parallel to the road as well as following a rock fence until you locate an old farm building. At this spot turn sharply left and proceed up some open fields then in among some trees. You should have a small creek (that runs to the right of the main creek) on your right side. About 50 meters after entering the trees, turn right and cross this little creek while looking for (rather small) cairns that mark the route. The route heads up slightly right of a field of boulders. Besides the small cairns there are also a few wooden signs with red paint. After the rock area, the trail steepens, but red signs should show the way. Follow this route steeply up until the slope of ascent decreases as you approach the basin. At this point, one should bear right and climb the ridge. On May 1st., there was a distinct gully filled with snow that allowed us easy access to a point higher on the ridge. An alternative is clearly to enter the ridge a bit lower in a fairly flat area. Our snow climb varied between 30 and 45 degrees and gained considerable altitude. Follow the ridge, typically near its center line, until it becomes horizontal before dropping slightly. You are now at the first narrow and slightly exposed section. The scrambling here is still mostly (American rating) class 2+, with perhaps one class 3 move across a crack (at least when it is snow covered and slippery). The route continues more uphill with easier rocks (and no exposure) across a fairly distinct "hump", before facing another narrow section which clearly is the crux of the route. On dry rock without snow, this may still be a class 3 section, our snow conditions would call for 2-3 class 4 moves. The last part of this section starts with a move down next to a very distinct pointed rock, then a pull up a vertical rock just left of a narrow crack. This route stays on the top of the ridge and has some exposure. The final move will take you around a rock on the left side on a fairly narrow ledge. From this ledge the difficulties ends and the remaining hike to the fairly flat summit is quite easy. One can avoid the last two moves by climbing left of the ridgeline, this may be the best way with summer conditions. In winter, (even on May 1.) this route involves crossing moderately steep snow located at the very top of a chute that quickly drops off into near vertical shape. The somewhat more difficult rock climbing avoids any danger that may be associated with this snow chute. 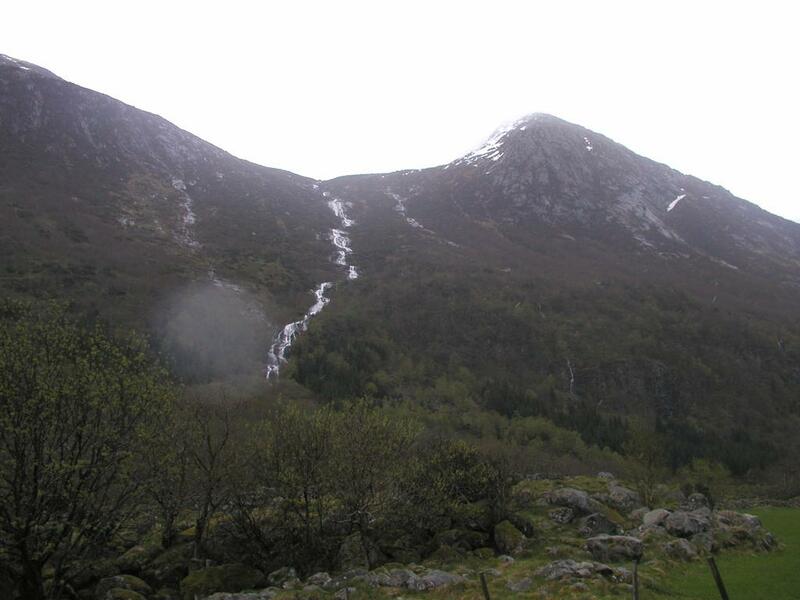 Alternative route: On May 12., 2006, Knut Sellevold wrote me and informed about an easier route to this summit: Hike up the valley "Vesle Laurdalen" directly south of the peak. 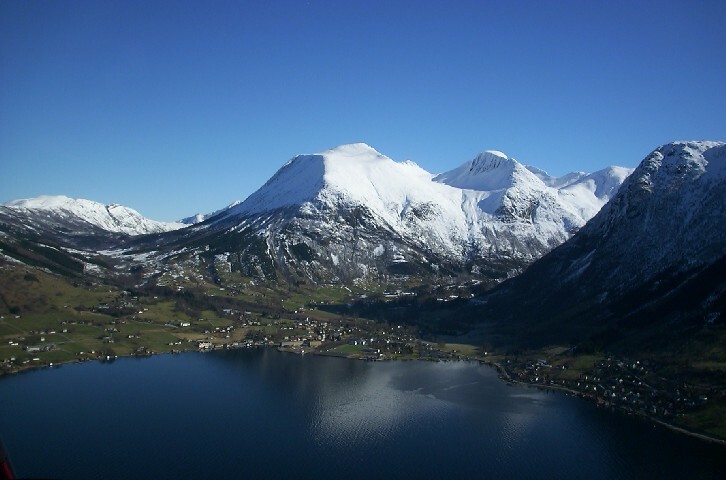 As you get to the lake (elevation 988 m), turn north (left) and follow the ridge that climbs toward the peak. 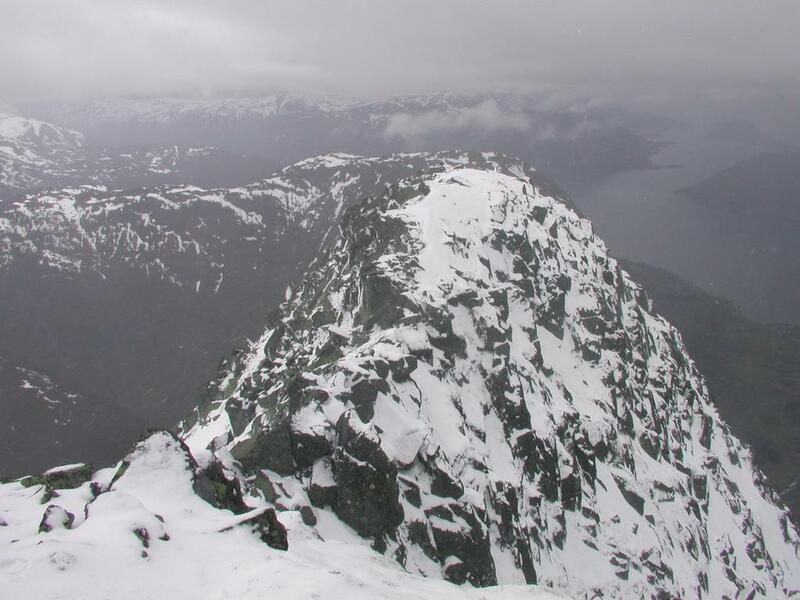 This ridge ends higher up in a gully (loose rocks) that can be followed to the summit plateau. Knut describes this route as having no exposure and that it only requires easy scrambling in the final gully. Comments: I did this climb with my friend Arnt. 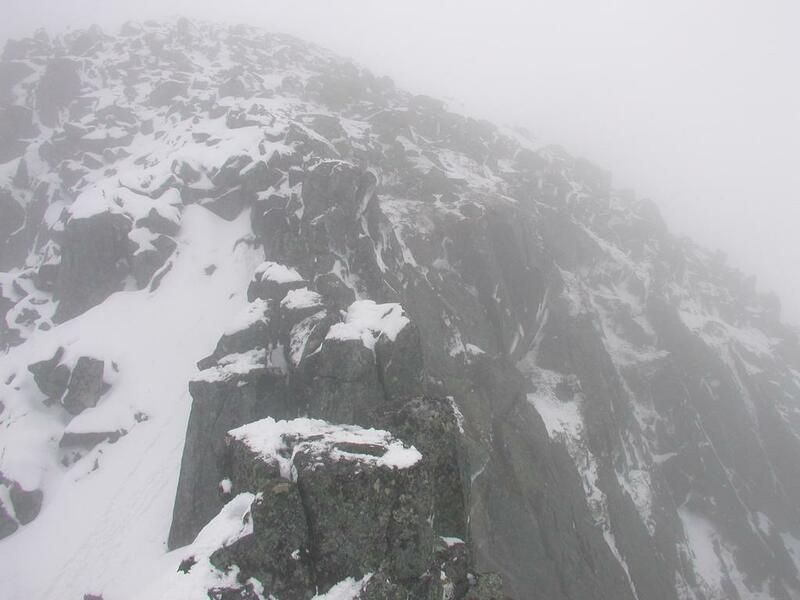 The conditions were far from optimal, with rain and (higher up) snow. The wind was also quite strong at times. Add the snow that made this ridge climb a good challenge. 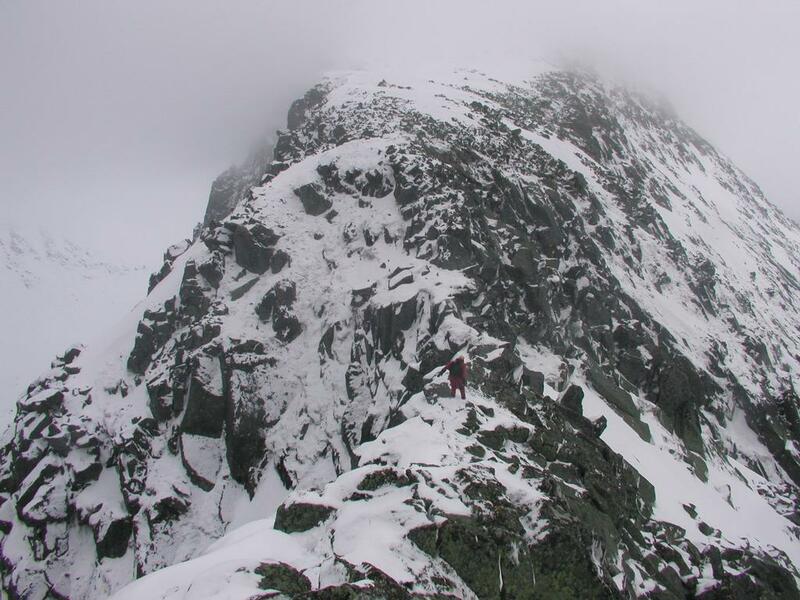 The ridge portion should still rate as a winter ascent. Perhaps this was the first ascent in 2002? The fact that this is a well known named summit without rank shows how such criteria may fall short in recognizing what absolutely "looks" like an independent mountain. The very complex topography of this mountain area is mostly to blame. 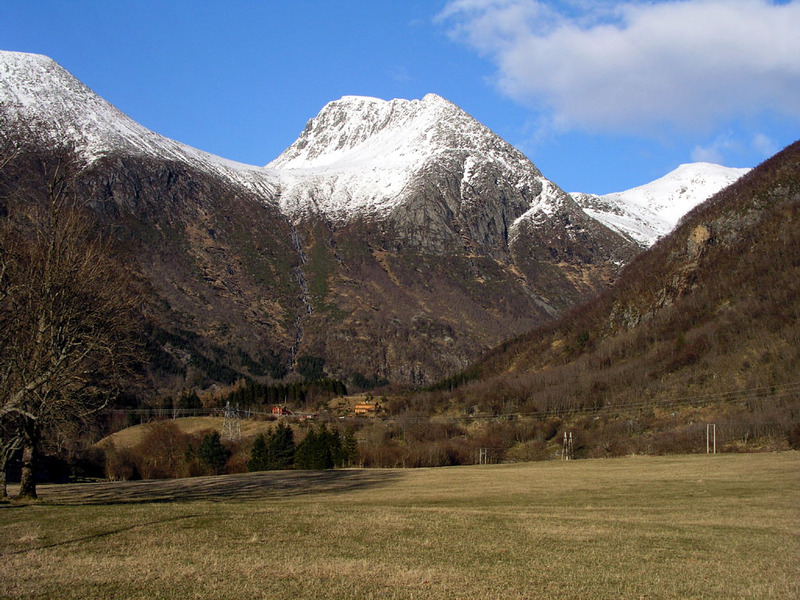 Rosendal,Melderskin (center) and Laurdalstind (right). The picture is from a small airplane by Frode Leikvoll, many thanks! Laurdalstind, the picture was taken April 5. 2003. Laurdalstind as seen from Rosendal. The creek mentioned in the route description is easily seen. 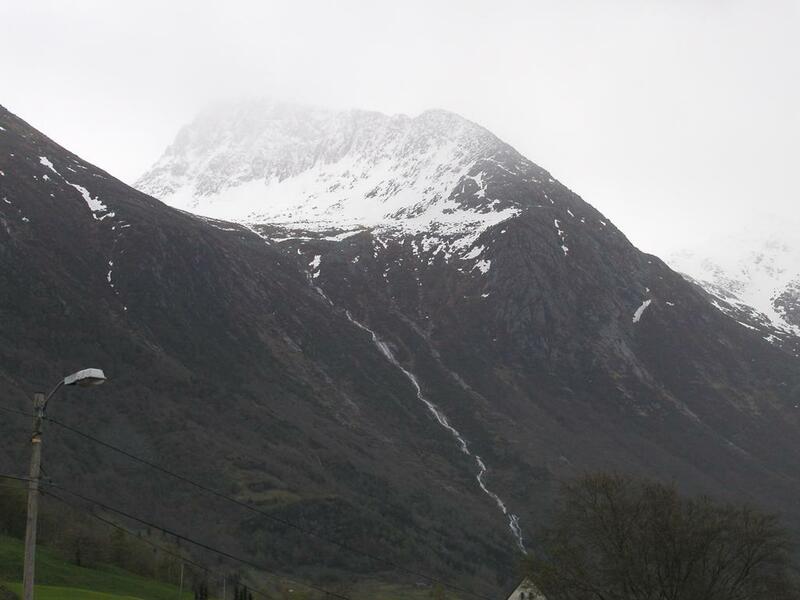 The snow gully is far right on the ridge (just left of a little snow triangle in the rock). The slope up to the basin, there is a marked route all the way. 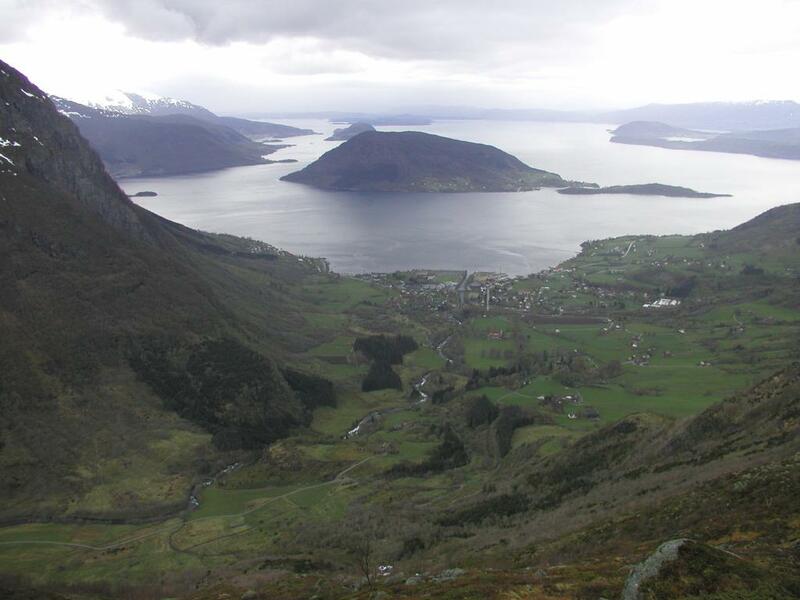 View of Rosendal and the Hardanger fjord. The Laurdalstind ridge. The "hump" with the two narrow sections can be seen, the summit is far left, while the snow gully entering the first part of the ridge is straight ahead. Me on the first narrow section, the main difficulty here is just ahead. On the "hump" looking back on the first part of the ridge. The crux of the route on the second narrow ridge between the "hump" and the final summit ridge.